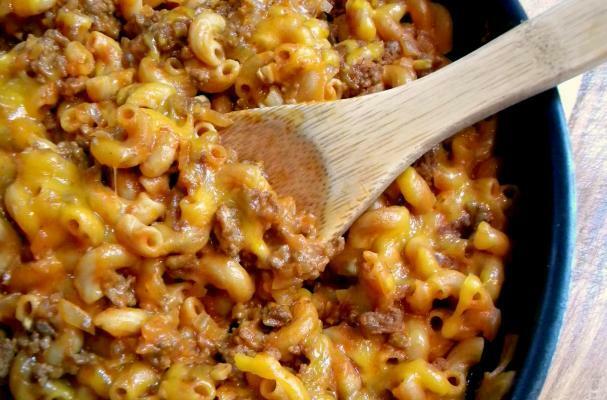 This tasty cheesy chili mac is so good your belly will say oh thank you, thank you (so will your family!). This one pan meal is ready in under an hour and there's almost no clean up (just what we like after the hectic holidays!). Serve this up with a simple green salad and some warm biscuits or cornbread for an easy dinner everyone will love. Heat the oil in a large (12 inch) nonstick skillet over medium-high heat. Add the ground beef, onion, chili powder, cumin, cayenne and 1/2 t. salt. Cook, breaking up meat into small pieces, until it looses all the pink color, about 5 minutes. Add garlic and cook until fragrant, about 30 seconds or so. Add brown sugar, tomato sauce, water and macaroni. Bring to a boil. Cover and cook, stirring often and adjusting the heat so that it maintains a lively simmer (somewhere between medium/medium-high heat), until the macaroni is tender, about 10 minutes or so. Season with salt & pepper if needed. Off heat, stir in half the cheese. Sprinkle the remaining cheese on top.